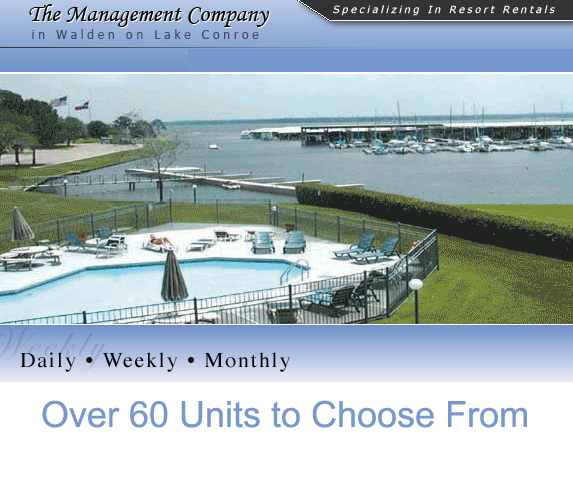 Conveniently located on Lake Conroe amidst the towering pines and ancient oaks, Walden is approximately 60 miles north of Houston, 15 miles west of Conroe, and 25 miles from The Woodlands Mall and the Cynthia Woods Pavilion. Over the past 30 years, Walden has hosted many famous people from all walks of life including politicians, professional athletes and Hollywood celebrities: President Gerald Ford, Presidents George H. and George W. Bush, Johnny Unitas, Bart Star, Billy Kilmer, Sonny Jurgensen, Bobby Lane, Tommy Kramer, Dan Pastorini, Kenny Houston, Roger Clemens, Craig Biggio, Jeff Bagwell, Bo Van Pelt, Greg Norman, Farah Faucett, Christie Brinkley, and more. In addition to its golf and tennis facilities, the Walden Yacht Club is a popular venue for weddings, reunions, holiday and dinner parties, business meetings and conferences.